ALEXANDRIA, VIRGINIA – June 14, 2012. 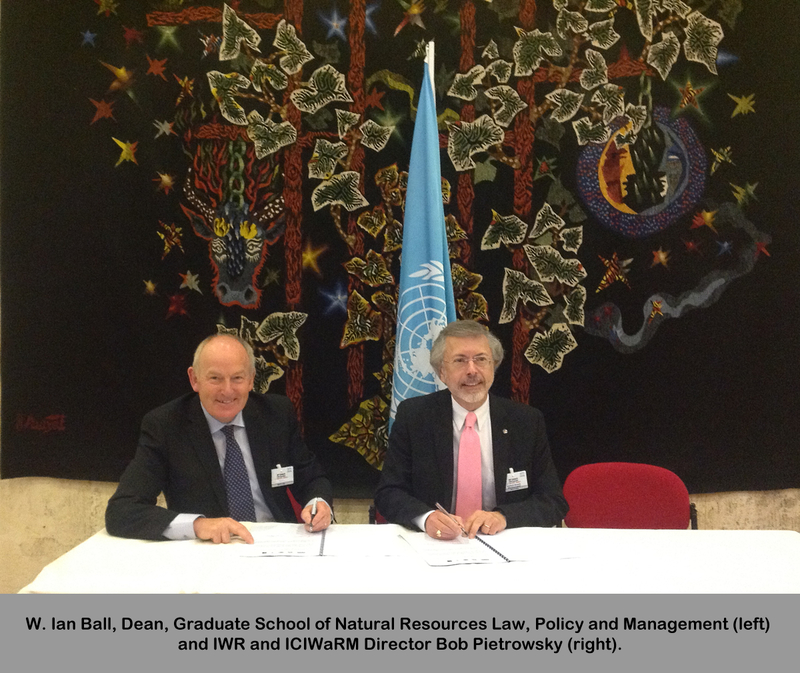 USACE IWR and ICIWaRM Director Bob Pietrowsky and W. Ian Ball, Dean of the Graduate School of Natural Resources Law, Policy & Management, University of Dundee, Scotland signed a memorandum of understanding for collaboration on water resources issues at UNESCO headquarters in Paris on June 5. 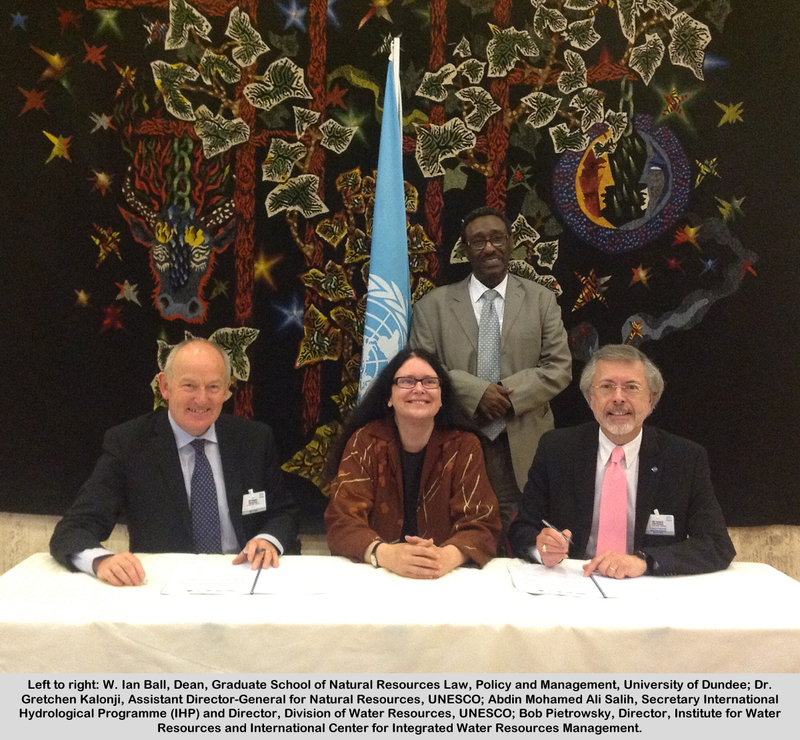 Dr. Gretchen Kalonji, Assistant Director-General of UNESCO for Natural Resources, and Dr. Abdin Salih, Secretary of UNESCO’s International Hydrological Programme (IHP), presided over the event, which took place at the biennial meeting of IHP’s Intergovernmental Council. 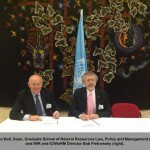 Left to right: W. Ian Ball, Dean, Graduate School of Natural Resources Law, Policy and Management, University of Dundee and Bob Pietrowsky, Director, Institute for Water Resources and International Center for Integrated Water Resources Management. centers. The centers envision cooperating in areas such as water policy and integrated water resources management. 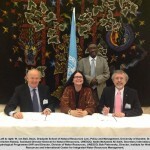 The two centers are both active in UNESCO’s Hydrology for the Environment, Life and Policy (HELP) program. ICIWaRM has sponsored meetings of the North American HELP network. The U.S. Army Corps of Engineers (USACE) was a co-founder of the Interagency Coordination Team of the Iowa-Cedar Watershed, which participates in the HELP program. The University of Dundee’s Graduate School of Natural Resources Law, Policy and Management IHP-HELP Centre combines water law, policy and science with a multidisciplinary approach that ensures that it is able to draw upon the full range of academic and practical expertise needed to effect real benefits for real rivers. The Centre is focused on developing the next generation of global water leaders through its Water Law Water Leaders flexible educational programs.